The goal is pretty simple: Have a dedicated cranking battery to ensure I can always start the engine if I leave a light on all night. I don't plan on using this battery for anything but starting, so I will be going with the cheaper true starting battery. I can also go with a slightly smaller battery since it doesn't have to be a group 27 or 8d to do its job. Despite having the option of going smaller (a group 24 would have been plenty!) I went with a dual purpose battery from West Marine. It was on sale, and the price was too good to ignore. Yes, I know that a dual purpose does neither job well, but I picked one that has way more cranking amps than needed, so it will do that job as well as needed. It also has a little more reserve than a dedicated cranking battery if I need to combine it to keep a light on or something. At some point you just need to get things done and not get hung up on the details and selection process. I can always change it out down the road. I selected the port cockpit locker for this battery because the battery compartment next to the engine is full of my house bank on the starboard side. By placing the cranking battery on the opposite side I add a little balance to the boat (although not as much as I'd like - the house bank is VERY heavy). There's no access to the back side of this bulkhead since it's the ice box. So, my only option was to use lag screws. I put in four of them, and they are pretty solid. I'm not too worried about it. This is a pretty ugly piece of wood, but I had it kicking around, and it will never show. At some point I'll go back and glass it into the bulkhead, but I want to run with it for a while to make sure the placement and configuration of the tray is something I want to be permanent. Knowing me, there will be future tweaks. In the mean time I will probably give a few coats of Epoxy this fall or next spring just to keep it waterproof. 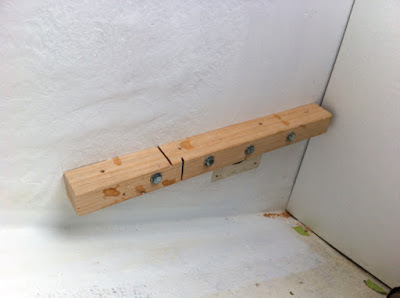 And here is the tray installed onto its cleat. 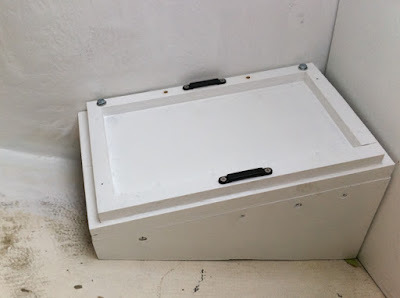 There is just enough room on the upper side (picture left) to route the bilge pump hoses out of the engine compartment and through the underside of this battery tray. That will somewhat secure them before they make the journey upwards to their loops before going aft to the through- hulls. The first design flaw I discovered is that the footman loops should have been level with the bottom of the battery box, and not mounted up on the fiddle. It turns out that they work OK despite, but at some point I'll cut out that area and get them where they need to be. The second thing I discovered is that the nylon webbing that comes with the West Marine (and probably many others since this box looks like every brand I've seen) is almost impossible to release. It took me about 5 minutes with a flat blade screwdriver to get the teeth out of the webbing. I'm hoping I had it mounted wrong, because that was the kind of fun I don't need to repeat. I'll probably substitute webbing from a hardware store at some point to improve the functionality. The cables rout through a notch in the locker divider a few inches above the tray. Getting them through was easy, and very close to the rest of the wiring harness, which is good for minimizing wire lengths and gauges.